On a late trip home after the obligatory post offsite dinner. Went to the Chophouse. Great restaurant if you like a side of meat with your meat. Strip sirloin on the bone – bewdiful. Not a bad beer list with a Two Metre Tall Bitter Amber Ale as the standout. 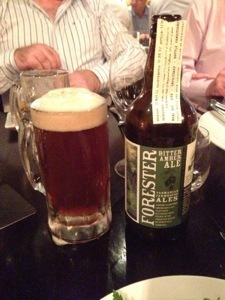 Post post obligatory dinner was had at the Paragon. This is a favourite of BotF correspondents when you get to the Quay before you thought you would and there’s a 15 minute window. Tonight I had a 10 minute window so a middie of resch was the go. The Paragon or the “Paragoon” or the”‘Goon” sells takeaway and remarkably I snaffled a Cuban cerveza. Cristal is made by Bucanero who claim to be near the cleanest, purest water in Cuba. Like the Chinese, they’ve knocked off German brewing property and techniques. The evening isn’t balmy but hardly brisk and the harbour is a millpond. No wind. It’s simply a much better journey home than the $45 cab ride. Better on expenses too. 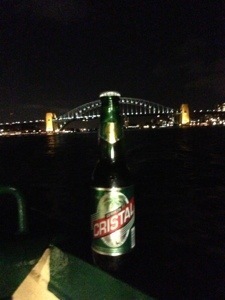 So to the Cristal. Teofilo Stevenson is the best thing to come out of Cuba. Cristal isn’t. I think the Cubans couldn’t translate the German recipe. Malt throwdown, not malt bomb.